On Christmas Day 2016, Thomas Coville completed a record-breaking trip. 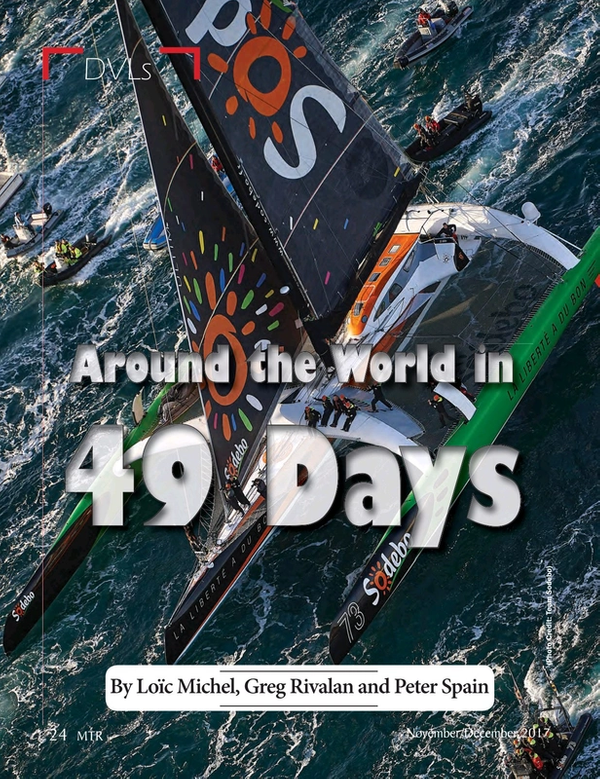 He sailed around the world in 49 days aboard Sodebo Ultim — a 32m French trimaran. Averaging 23 knots over the 27,000-mile course, Coville reduced the previous record for solo global circumnavigation by eight days. That record had stood for 12 years. In fact, Coville had previously made three unsuccessful attempts to break it. For two weeks, Coville’s route headed south from France down the Atlantic and far into the Southern Ocean. There he picked up strong winds called the Roaring Forties. In less than three weeks, Coville sailed clockwise around Antarctica keeping the Indian Ocean and Pacific Ocean à gauche. After 32 days of sailing, Coville finally turned north into the Atlantic, headed to his homeland and the finish line. Apart from finding the right winds, a key aspect of global race sailing is maximizing the component of a sailboat’s velocity along the direction of the true wind. Sailboats cannot sail directly upwind. As a result, there is inevitably some sideways drift to leeward of the desired course. This drift is called leeway. The engineering team for Sodebo sought a new approach for measuring speed-through-water and leeway. Existing devices could not accurately report the high speed and acceleration of this custom racing boat. Accounting for high acceleration is critical for accurately measuring winds. To meet these needs, Coville’s team selected Teledyne RDI’s (TRDI) Doppler Velocity Log (DVL). As well as supplying the traditional piston DVL design, TRDI provides DVLs in a patented 2D phased array configuration. This technology pushed back the practical, mechanical limits for transducer size and frequency at both ends of the size continuum. At 600 and 300 kHz, phased array technology permits very accurate, precise and robust navigation in smaller configurations. TRDI’s phased array product lines also include lower frequencies for longer measurement ranges. A DVL is a sonar system that measure motion underwater. Using sound waves, the DVL works like hand-held radars used by police to catch speeding motorists. The vertical range of this measurement is greater for lower frequency sound waves. To measure motion, DVLs emit sound bursts along beams angled downward in different directions. Echoes are returned due to scattering off the seabed. Because the DVL sonar is aboard a moving vehicle, returning echoes carry a change in pitch; this is the Doppler Effect. Generally, a different frequency shift is heard along each beam. Combining these readings tells how fast the vehicle is moving and in what direction. Currents and winds can change the path traveled by a vessel. The dead-reckoned track is estimated using only ship speed and heading. This estimate needs to be corrected for the effects of water currents and winds. Obviously, winds cause a sail boat to move along its track. Yet wind also causes motion across the vessel’s heading. This downwind motion is called leeway. It can be seen by a sensor that is looking at the water. The effect of leeway can be seen when the vessel’s wake is angled away from straight astern. To counter leeway, sailboats with multi-hull designs use adjustable daggerboards. These are retractable keels that slide vertically through a slot in the hull. The shape of a daggerboard makes it act like a vertical wing; it converts forward motion into windward lift that opposes leeway drift. This countering effect can be adjusted by varying the immersion of the daggerboard. The tradeoff is that greater immersion also creates more drag to oppose the sailboat’s forward motion. Minimizing sideslip due to winds and currents is a critical advantage in competitive sailing. Measuring leeway can provide key information for winning. A rapid and accurate system to measure leeway gives a navigator direct and immediate feedback after course changes or daggerboard adjustments. This information helps in tuning the boat’s use of wind power to move most efficiently to the desired destination. Sodebo’s Engineering team desired more accurate measurements of the high speed and acceleration of Sodebo Ultim. They needed to evaluate design changes made to improve the trimaran’s performance. Better velocity measurements had several advantages. Not only did they report speed-through-water and leeway but they enabled more accurate values for measured winds. The latter are the vector sum of actual wind and boat velocities. Sodebo selected Teledyne RDI’s Explorer DVL to meet these needs. This device uses a flat-faced phased-array transducer to measure speed-through-water with 0.3 percent accuracy. Moreover, the DVL’s BroadBand signaling outputs low-noise velocity measurements. Thus, the sailboat’s navigation system can benefit from high quality data at higher update rates than other DVLs supply. For a boat that sees both warm tropical waters and chilly sub-polar seas, the phased array design of this DVL offers an unusual advantage. The calibration of horizontal speed measurements is insensitive to changes in water temperature (and salinity). Thus additional sensors for measuring water properties are not required. In 2014, the Sodebo team equipped its multi-hull racing boat with the Teledyne RDI DVL. At times, the outer hulls will rise above the water so the DVL is in the center hull. A unique aspect of this installation was that the DVL sits inside the carbon fiber hull. The reason for this unusual location was to avoid adding hydrodynamic drag. Such drag is unavoidable with in-water DVL installations. At the same time, having the DVL transmit and receive signals though the hull created other issues. Tests verified the phased array transducer had efficient acoustic coupling. As well, the effect of the hull was checked for causing signal distortion. Combining the DVL and GPS data observed while underway reveals ocean surface currents. The Teledyne Explorer DVL measures the sailboat’s velocity through the water. The GPS outputs the sailboat’s velocity over ground. The surface currents emerge continuously as the vector sum of these two data types. For a fast-moving sailboat, calculating leeway accurately requires knowing the DVL’s exact alignment. To this end, the system was calibrated in coastal waters where the DVL’s acoustic signals can reach the seabed. The bottom tracking of the DVL measures sailboat velocity relative to the seabed. Merging these data with heading from a fiber-optic gyrocompass delivers sailboat velocity and trackline in earth coordinates. GPS data can supply similar information. Comparing these two data records reveals the alignment angle between the DVL and the boat’s heading. Once the Teledyne Explorer DVL’s performance was validated, its output stream was fully integrated into the navigation system of Sodebo Ultim. Later a new software was developed to display boat velocity and leeway in real time. Once proven, the Teledyne RDI DVL was used in a couple of ways by Team Sodebo to improve boat performance. As well as directly reporting leeway to the helmsman, the DVL data helped with evaluating refinements to the boat’s foils and dagger boards. Vessels such as Sodebo Ultim that sail through remote seas can collect new marine information about poorly known regions. The French Ocean Agency IFREMER partnered with Team Sodebo on this project. These researchers plan to analyze water currents observed from Sodebo Ultim. Part of the work will be comparing these direct observations with currents inferred from satellite altimetry. The latter miss wind-driven currents that can be significant in the Southern Ocean. Shortly after Coville’s successful circumglobal trip, the DVL data and boat navigation logs were sent to Teledyne Marine’s France office, where a map of water currents was generated and a detailed report was prepared. It validated both the DVL installation and the measurements collected during the trimaran’s travels. The Sodebo team intend to integrate two of the new miniature phased array DVLs on the future version of the Sodebo Ultim scheduled to be unveiled in 2018. The team’s goal is to beat the around-the-world record again in 2019. For two decades, Loïc Michel has worked as technical support, management, and Director for Teledyne RDI, Europe. He has a technical degree in Physical measurements. Since 2005, Greg Rivalan has worked in technical support, application engineering, and product management for Teledyne RDI, San Diego. During 27 years at Teledyne RDI, Dr. Peter Spain has worked in Sales & Marketing from staff to management with a common theme of Technical Marketing.